Caution: FTTO and passive OLANs use singlemode fiber and primarily use APC (angled physical contact) connectors to prevent problems with reflectance at connections. APC connector are color-coded with green bodies and/or strain-relief boots. Reference cables for insertion loss or OTDR testing must have matching APC connections for testing to prevent damage to the connectors and get realistic test results. SC Connectors: Multimode (beige), Singlemode PC (blue), singlemode APC (green) - DO NOT MIX THEM UP! Warning: Since most OLANs are based on singlemode fiber, the quality of the patchcords is EXTREMELY important. Contractors installing OLANs have complained about the quality of singlemode patchcords bought from unknown suppliers and/or based on price. One contractor had to replace over half of the patchcords because they did not work. Buy patchcords from known suppliers, preferably those qualified to telco purchasing specifications to avoid problems. It is recommended to test a sample of patchcords from each batch just in case. The link is a single run of fiber, e.g. : from OLT to ONT at each user work area. The fiber run may have connectors, the number of which depending on whether the links are spliced or use connectors for terminations. Links may use preterminated cables to speed installation. All links should be tested for insertion loss. You must measure insertion loss, a test which is similar to how the transmission equipment will use the fiber. Since we consider 3 types of OLANs, there are three testing options. 1) FTTD (centralized fiber) uses multimode fiber with transmission at 850nm. Test with a source at 850nm and reference cables which match the cable plant (some still use 62.5/125 (OM1) fiber but 50/125 (OM2/3/4) fiber is more common.) The use of mode conditioning is recommended. Testing in one direction is generally considered adequate, but if the test requirements call for bi-directional testing, it must be done. Compare results to the loss budget for the link. 2) FTTO links are singlemode fiber and most transmission is at 1310nm, so test with a 1310nm laser source intended for singlemode testing. Testing in one direction is generally considered adequate, but if the test requirements call for bi-directional testing, it must be done. Compare results to the loss budget for the link. 3) In passive optical LANs, the loss of the PON splitter must be included in the loss budget for the link. 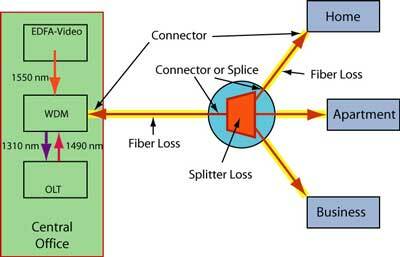 See FTTH Architectures for more information on PON splitter losses. After the link is installed, it needs testing from end to end. The end-to-end loss includes the connectors on each end, the loss of the fiber in each link, the connectors or splices on the splitter and the loss of the splitter itself. Since the fibers are being used bi-directionally and connector or splice loss may be different in each direction if the fiber core diameter (mode field diameter for SM fiber) is different, testing in both directions is important too. You must measure insertion loss from the OLT to the ONT with OLTS at all wavelengths and bidirectionally to check all operational modes - similar to how the transmission equipment will use the fiber. Optionally, the installer may test splitters separately. If these are pretested, as they should have been, this may not be necessary or advisable, especially since it is time-consuming and costly. This diagram shows the OLT which uses 1490nm downstream and 1310nm upstream. It also shows AM video at 1550 downstream, not common but sometimes used on passive optical LANs. Special FTTx PON OLTS are available that test the proper wavelengths in each direction, simplifying testing logistics. However, since most SM test sets have sources at 1550 and 1310nm, one may test at 1550nm instead of 1490nm downstream because the difference in loss of the cable plant will be small. If you plan to use an OTDR to test OLANs, read this on testing PON FTTH systems. Network equipment will be tested as the system is turned on or for troubleshooting. Will the network equipment transmit and receive properly? If the cable plant is installed correctly and tests within specifications for loss and reflectance, it should. Most OLAN equipment has extensive self-testing capability and that may prove sufficient for most testing. PON couplers may have a second port on the upstream side just for testing or unused downstream connectors may be useful for testing, especially with OTDRs. OLAN safety issues include all the usual fiber installation issues, for example working with bare fibers, solvents and adhesives. But OLAN networks, especially passive OLANs, have several other potential problems. Links carrying AM TV signals will have high power from EDFAs, especially before the splitters. And links may have multiple equipment transmitting simultaneously. Either case can cause high optical power that can be dangerous to worker’s eyes. Care should be taken to not expose eyes to light from the fibers and to always use microscopes with infrared filters, just in case. Since systems may have multiple systems transmitting on the same fiber, it is harder to ensure that all systems are turned off for inspection or testing, also. And, since up to 32 users may be sharing the CO based network equipment, turning off systems for troubleshooting is not desirable, so testing may have to be done with equipment in service. Exercise care. More on fiber optic safety.